Preheat oven to 325°F. Place 1/2 cup of pumpkin seeds in each of 5 small zip top baggies. Squeeze 3/4 teaspoon of red coloring into one bag. Squeeze 3/4 teaspoon of yellow food coloring, and 1/8 teaspoon red food coloring into a second bag. Squeeze 3/4 teaspoon yellow coloring into the third bag. Squeeze 3/4 teaspoon green coloring in the fourth bag. Squeeze 3/4 teaspoon blue coloring in the final bag. Close the bags tightly, and squish the bags until the coloring coats the pumpkin seeds well. Lay the colored pumpkin seeds on a parchment or foil lined baking sheet. Place in preheated oven. Bake for 10-15 minutes, or just until food coloring dries. Allow to cool before crafting with the seeds. To decorate pumpkins: Use tacky craft glue to adhere the seeds onto the pumpkin. Have fun! Who says this time of year has to be all black and orange, orange and black? We say rainbow is the new hot color for the fall holiday, and there's no talking us out of how cool these colorful seeds are to decorate with! Two things. That's all you need to make these brightly hued pumpkin seeds. Like little gems for your seasonal décor, rainbow pumpkin seeds are better than confetti and way cuter than carving a boring old jack-o-lantern. Start by putting pumpkin seeds in little zip top bags. You can harvest them fresh from your pumpkin, or use the bags of ready-roasted seeds. If using the fresh seeds, make sure you've cleaned and dried them incredibly well for best results. Squeeze a smidgen of Betty Crocker gel food coloring into each bag. Squish the bags around, making sure the color coats the seeds. Gently squeeze the seeds onto a parchment or foil-lined baking sheet. Bake for 10-15 minutes, or until the color has dried. Got kids? Call 'em in to help! No kids? No prob -- this is fun and easy even for us adults. 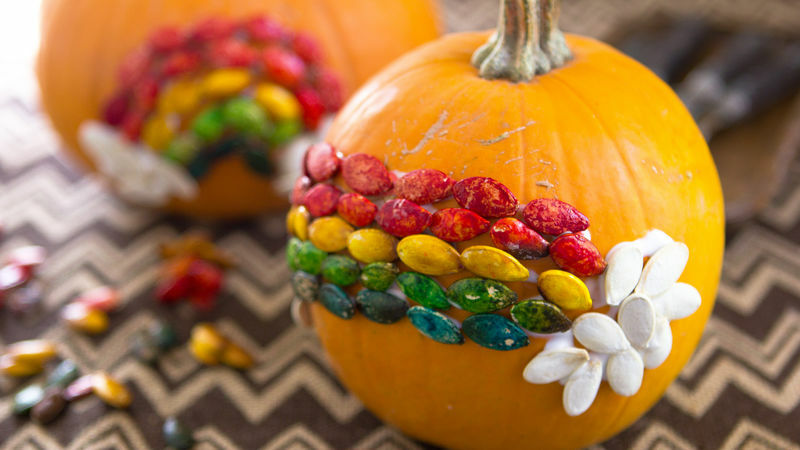 Start decorating those pumpkins with your rainbow pumpkin seed. Please -- no snacking on the seeds -- but gluing them onto the clean, dry exterior of a pumpkin is a fun way to get your house ready for Halloween and beyond! Once they're ready, put your pumpkins out on display! Just think of the possibilities: A pumpkin with the initial of your last name placed on your doorstep, or a colorful turkey as your Thanksgiving table centerpiece -- or a fun and frolicking rainbow like we did just because. No matter what you make with your colorful seeds -- just do it!